The end of the very first month of 2018 has arrived and I quite pleased with keeping up of some of my new year's resolutions. Small, baby steps are key rather than plunging in straight hot and heavy, I say. This month has been focusing on more minimal makeup, as I've gotten eyelash extensions and boy does that shorten the time to do my makeup. I am not too sure if I would do them again (probably will, if I am feeling lazy) but they definitely have made life easier this month. I also haven't been using foundation as of late, so my makeup routine is truly short and sweet. 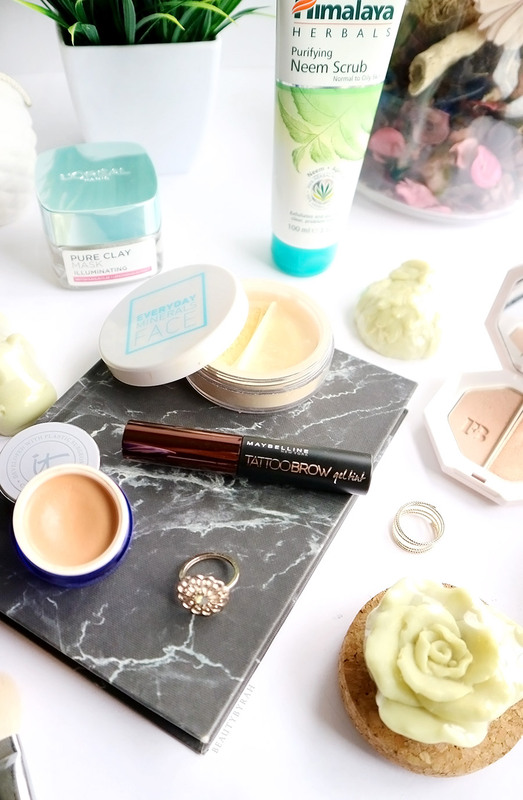 Despite not wearing foundation, I do like to apply a think veil of powder onto the face to remove the slick that results from my moisturiser and sunscreen. I got this Everyday Minerals Finishing Dust as a free gift from iHerb (not too sure why, but we don't question free gifts), and I have been enjoying it ever since I've received it. 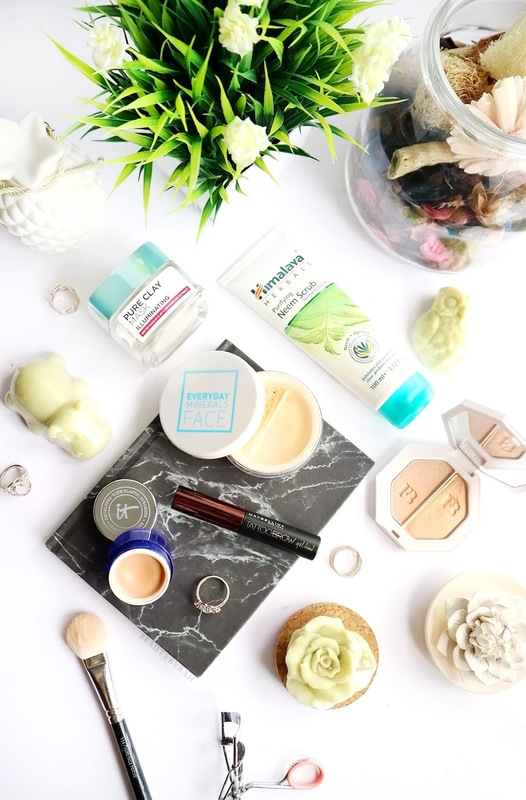 Everyday minerals is a brand that I've always wanted to try as as their products are 100% vegan and cruelty-free, and their ingredient list is short and understandable. This Finishing Dust is a setting powder that comes in a plastic jar with a twist lid to dispense product (very similar to mineral powder foundations such as Bare Minerals). The ingredients are Zea Mays (Corn) Starch, Ribes Nigrum (Black Currant) Fruit Extract, Citric Acid and Iron Oxides. I really like how this powder makes me skin looks. It is very finely milled and when applied to the skin, it does not sit on the skin and gives the skin a natural look without being too dewy or dry. 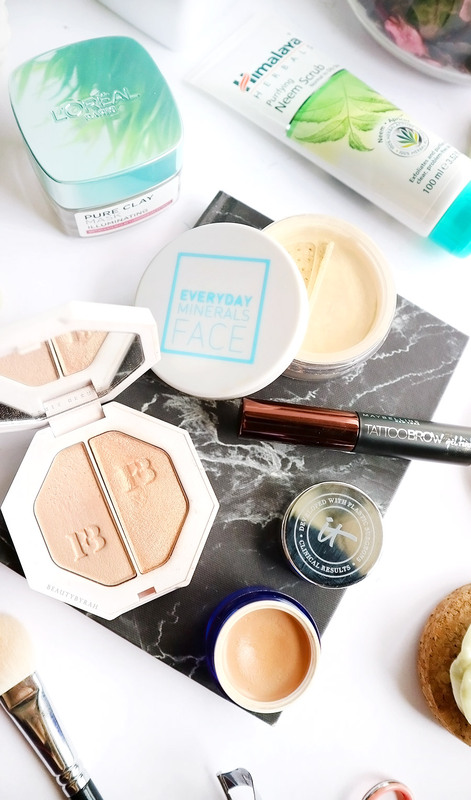 I usually would just take a large powder brush to sweep this gently all over my moisturised face and this removes the shine without looking cakey. I also found this to have pretty good oil control abilities, as I only see my oil seeping through around 4 hours later. Even though it is supposed to be translucent, I do think that this does impart some colour to the skin if used heavily. Overall, I am currently obsessed with this powder and can't seem to stop using it daily. I love this highlighting duo as it gives the option of a subtle natural glow to the skin or a poppin' one that can be seen from space. Both powders can also be mixed or layered to one's desire. I have been wearing pretty minimal face makeup recently but a glorious sheen to the high points of the face is always welcomed in my books. I really enjoy the formula of this highlighter as it applies onto the skin nicely and it doesn't look like it is just sitting on the skin. The subtle highlight, Mean Money is so beautiful on those minimal and natural days and if I want to amp it up, I simply take a little of the more intense shade, Hu$tla Baby and apply it to the centre of my cheekbone to emphasis the glow. I have mentioned this before in my November Favourites but I just love this so much that I have to mention it again. Peachy correctors work amazing in reducing the darkness under the eyes and the amount of concealer required to hide em'. I used to layer after layer concealer under the eyes as my dark circles are pretty obvious and I hated how tired it makes me look. Ever since I've discovered colour correctors, let's just say it was life changing. I have quite a few but I do find that the IT Cosmetics Bye Bye Undereye Corrector is the perfect shade to cancel out the brownish tones from my undereye circles. It also blends well under the eyes without looking heavy or creasing. Even after layering some concealer over it, my undereyes do not look like they have tons of product on it and I really like that. I was extremely weary of this in the beginning, as I've seen a few videos where people try to tint or dye their brows and it goes horribly wrong. One day, I decided to put this to the test as I had nowhere to be and was pleasantly surprised. This brow gel tint comes with a mini brush that helps to apply the viscous gel onto the brows pretty easily. The brush does give a good amount of control but I do highly recommend cleaning up with a cotton bud / Q tip after as it can stain the skin if you get it beyond the brow hairs. Leaving it on for 20 minutes will allow the brows to last for a day, and leaving it on for 2 hours enables it to last for about 3 days. After it sets, removal was pretty easy. With a thicker layer, I could simply peel off the entire strip at one go, revealing tinted and thus, fuller brows. This makes life easier as I don't take half as long to fill in my brows and sometimes, I go without any brow product. I use mine in the shade dark brown and it is a little cooler in tone than my reddish hair, but nothing a light dusting of brow powder can't fix. With an affordable price of SGD 19.90, I will definitely repurchase this when mine runs out! My office recently had a team bonding event where we headed to Soap Ministry at Clark Quay for a little hands on soap making workshop. Honestly, I've never really given soap much thought before but after this workshop, I realised that the harsh chemicals such as sodium lauryl sulfate in many facial and body soaps aren't good for the skin as it strips skin of the its moisture. In this workshop, we custom made our own soaps by choosing the soap base, herb, and essential oils. I chose the goat milk's soap base, added in Spinach Powder (which is meant for all skin types and helps with whitening, adding moisture to dehydrated skin and strengthen the skin against UV rays) and rose, lavender and tea tree essential oils. Rose helps with hydrating, whitening and anti-aging, lavender aids in calming the skin while providing antiseptic properties and tea tree helps with acne. It was fun mixing them up and watching them solidify in the moulds. I've been using this soap twice daily for around 2-3 weeks now, and I really like how my skin feels. It does not feel dry nor tight and I seriously look forward to washing my face now. There's just something about making your own soap. I do highly recommend you giving it a try! Soap Ministry also has a variety of handmade soaps that you can buy off their shelves as well. I've been good on exfoliating my skin, using both chemical (nightly) and physical exfoliants (weekly), and I can really see a difference when it comes to my skin texture and radiance. For the past month or so, I have been using the Himalaya Herbals Purifying Neem Scrub as my physical exfoliator and I have been really enjoying it so far. This scrub is formulated with active Turmeric extract, which has antiseptic, antibacterial and anti-inflammatory benefits, and neem which also has great antibacterial properties. It contains very fine apricot granules (unlike the infamous St Ives Apricot Scrub) which helps to gently exfoliate the skin. This scrub does not feel harsh on the skin at all, and I am deeply in love with the scent. My skin feels nice and smooth after, without feeling tight. For a price of SGD 8.50, this is an affordable option that I do recommend you picking up to try! As I haven't been wearing much base makeup lately, I do focus quite heavily on improving my skin's natural radiance as dull skin is just never appealing. 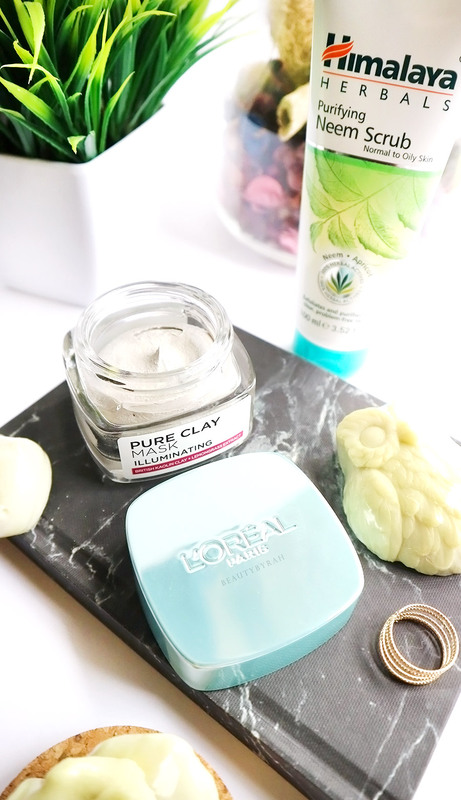 I've been relying on my L'Oreal Illuminating Pure Clay Mask to help give my skin that brightening boost on days when my skin looks sluggish and lack lustre. This mask contains British Kaolin Clay which helps to mildly exfoliate the skin to refine the skin texture and remove impurities and Lemongrass Extract which delivers anti-dullness efficacy and had anti-oxidant properties. This mask works so well in giving my skin the boost that it needs and it only requires about 10 minutes. This retails for SGD 14.90 and once again, I highly recommend you picking this out! I would usually include a book of the month in my monthly favourites but I did not read much this month, sadly. Currently, I am only reading Investing Online for Dummies as I am trying to figure out how investment works and how to be an adult. Pretty boring stuff, but essential I feel. Hope 2018 was off to a great start for you! I am pretty pleased with how January turned out for me and am ready for what February brings. What were some of your favourites this month? Also, if you have any non-fiction books to recommend, please share them with me!